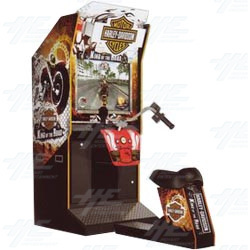 Harley Davidson: King of the Road SD Arcade Machine is a licensed motorcycle game from Sega. The player can experience riding a realistic Harley motorcycle while rocking out to classic 70s tunes, such as 'Highway Star' and other originals from BMG! The cabinet links up to four cabinets so players can challenge their friends to a road trip and provides a V-Twin experience with motion systems and realistic movement. Players choose their ride from a lineup of motorcycles that can be enjoyed by all players, not just Harley fans, and includes a variety of models from the latest bikes to vintage classics. Once you've chosen your ride, join the race started by the mysterious main character, the "King". Pass numerous rivals and reach the goal within the time limit. when all rounds are cleared and a certain amount of points are scored, the player obtains a battle certificate into the Final Round Challenge. The game is won when the player defeats the "King". Harley Davidson: King of the Road SD Arcade Machine is a licensed motorcycle game from Sega. The player can experience riding a realistic Harley motorcycle while rocking out to classic 70s tunes, such as 'Highway Star' and other originals from BMG! The cabinet links up to four cabinets so players can challenge their friends to a road trip and provides a V-Twin experience with motion systems and realistic movement. Players choose their ride from a lineup of motorcycles that can be enjoyed by all players, not just Harley fans, and includes a variety of models from the latest bikes to vintage classics. Once you've chosen your ride, join the race started by the mysterious main character, the "King". Pass numerous rivals and reach the goal within the time limit. when all rounds are cleared and a certain amount of points are scored, the player obtains a battle certificate into the Final Round Challenge. The game is won when the player defeats the "King". This is a video taken by Highway Games of the Harley Davidson: King of the Road game from Sega. This is a video of the Harley Davidson: King of the Road Cabinet DX cabinet which features a replica Harley Davidson motorcycle and a huge 62 inch screen.